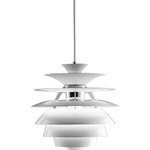 PH 4/3 Pendant is a member of the of the PH 3-shade family principles, which were developed in the winter of 1925-26 for a large exhibition hall in Copenhagen, Denmark called "Forum". The combination of diffused reflection and a logarithmic shade curve gave PH the opportunity to control a fixture's glare and shading, as each shade would evenly decrease the amount of light emitted according to their distance from the bulb. The PH fixtures were designed as a rational lighting system where the size of the shade, its material, and its surfaces could be combined mutually according to the nature of the assignment. 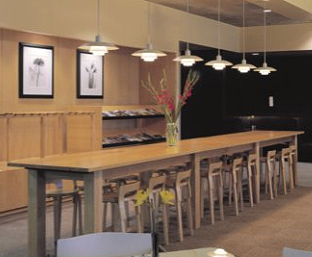 The PH3-shade system started out as a pendant solution but very quickly it also developed into other kinds of fixtures and chandeliers. 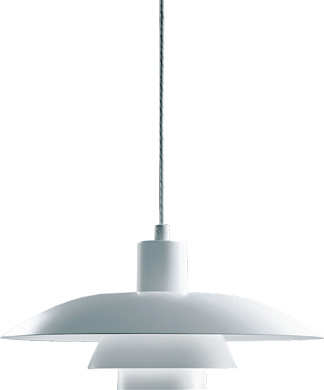 Poul Henningson's lifelong collaboration with Louis Poulsen Lighting began in 1925 and lasted until his death. 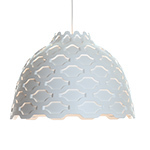 To this day, Louis Poulsen Lighting still benefits from his genius. Poul Henningsen's pioneering work concerning the relations between light structures, shadows, glare, and color reproduction-compared to man's need for light remains the foundation of the lighting theories still practiced by Louis Poulsen Lighting. 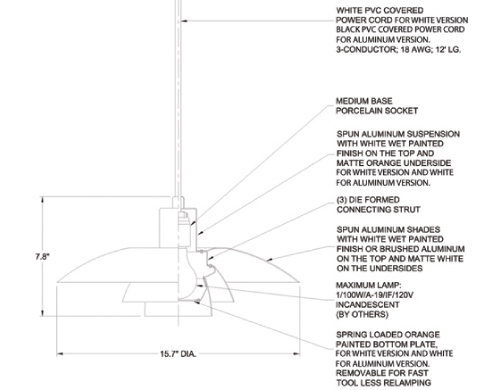 PH 4/3 Pendant provides a primarily downward illumination. It is based on the principle of a reflecting multi-shade system, creating a harmonious and glare free illumination. Offered in white classic matte. 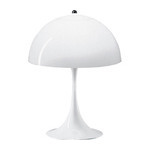 $646.00 + free shipping in the continental U.S.
Poul Henningsen (1894-1967) was born in Copenhagen to the famous Danish actress Agnes Henningsen. He never graduated as an architect, but started practicing traditional functionalistic architecture. This led him to focus on what he would become the most well-known for, lighting; although he also had a significant literary career. At the beginning of WWII, he was forced to flee Denmark during the German occupation but soon became a vital part of the Danish colony of artists living in Sweden. 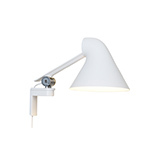 Danish lighting manufacturer Louis Poulsen was founded in 1874. 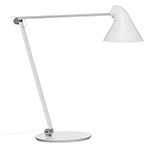 Some of the company's best designers were Arne Jacobsen and Poul Henningsen. 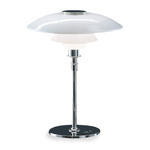 Henningsen created the well known PH-Lamps line and the iconic "Artichoke" Lamps. For over 70 years Louis Poulsen has been working with visionary designers, thus the Danish company has become one of the worlds most innovative manufacturers of lighting solutions. The revolutionary ideas of designers and and architects such as Verner Panton and Arne Jacobsen could become reality only by profound production know how.